Salmon with dried turnips, whey, nettle, and nasturtiums at Ursa Minor. Our server at Ursa Minor presented the menus with one small caveat: The halibut dish wasn’t yet available. The restaurant wasn’t out of the day’s supply, she assured us. Quite the opposite: the fish wasn’t yet in from the boat in the sweep of Salish Sea that glittered right outside the broad windows. If we wanted to order it, we’d have to wait a bit. We did want it, and we didn’t mind the wait at all. Not when we could settle back in our curved midcentury chairs as a gently rippling canopy of wisteria filtered the early evening sun. Not with a Lopez Island Brewing IPA in hand and a trio of side-stripe prawns, dusted with spruce tips and plated in tight formation alongside horseradish aioli, on the table. 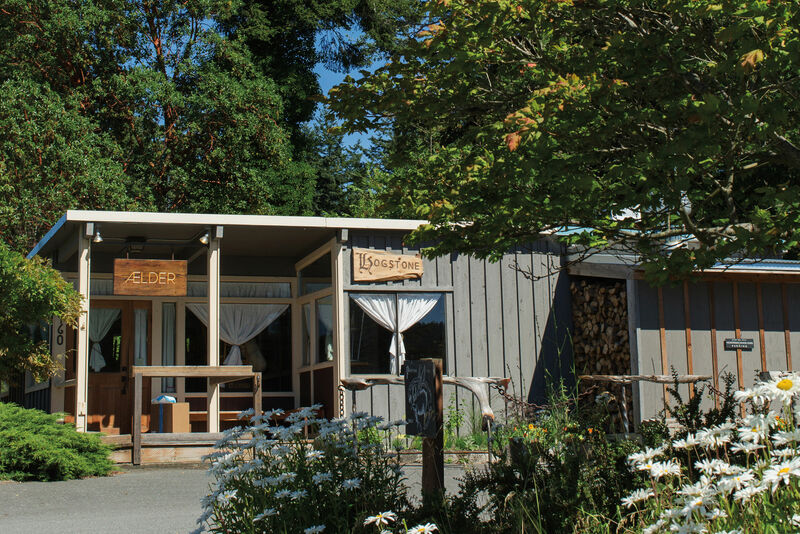 Ursa Minor is on Lopez Island, just 66 miles from Seattle as a seaplane flies, but can be four or more hours, door to door, once you factor in traffic, time on the ferry, and the wait to secure a berth on the limited number of daily sailings. 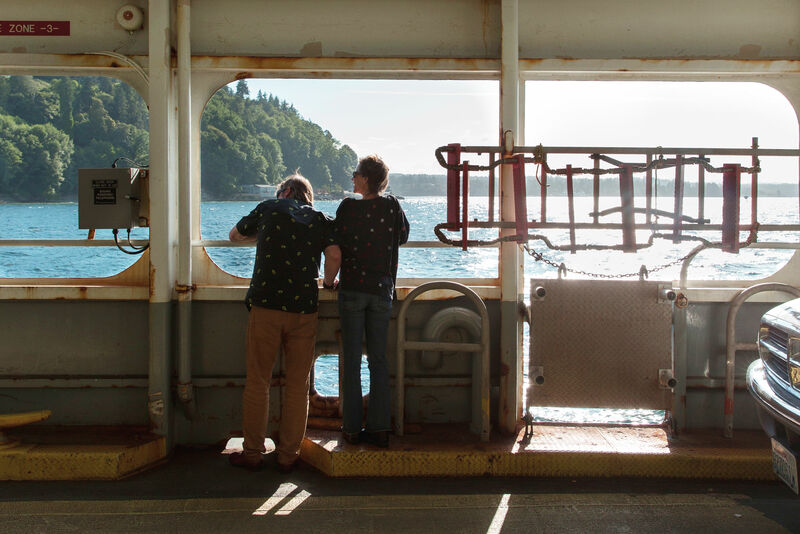 There’s a certain dichotomy that’s particular to both the San Juan Islands and the ports along Washington’s northernmost coast: Proximity to Seattle and yet the feeling of being wholly removed. 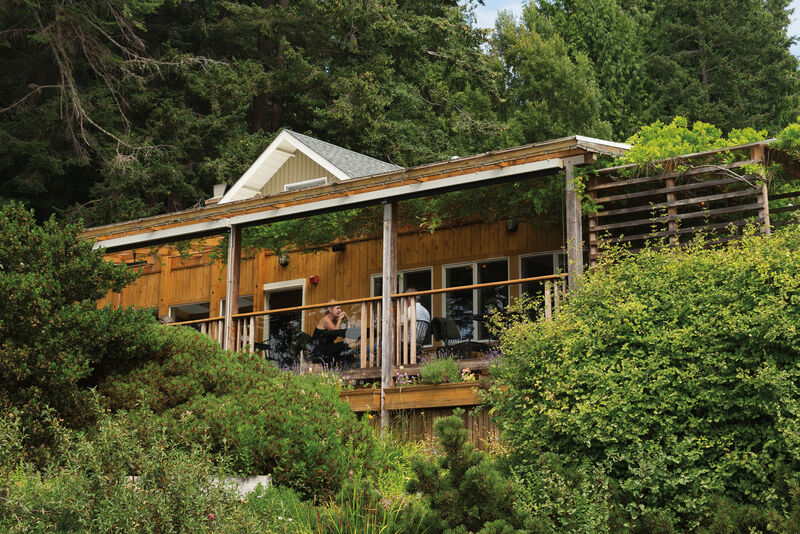 Here, chef Nick Coffey is part of a movement that began with Blaine Wetzel at the Willows Inn on nearby Lummi Island. Last year, Coffey took over a restaurant space designed by architecture great Roland Terry in Lopez Village, the island’s commercial center. Coffey had fallen in love with this particular island when he and his now-wife would flee Seattle to camp, bringing along zero food because they knew they could forage and buy what they needed from the honesty box farmstands that dot roadsides. 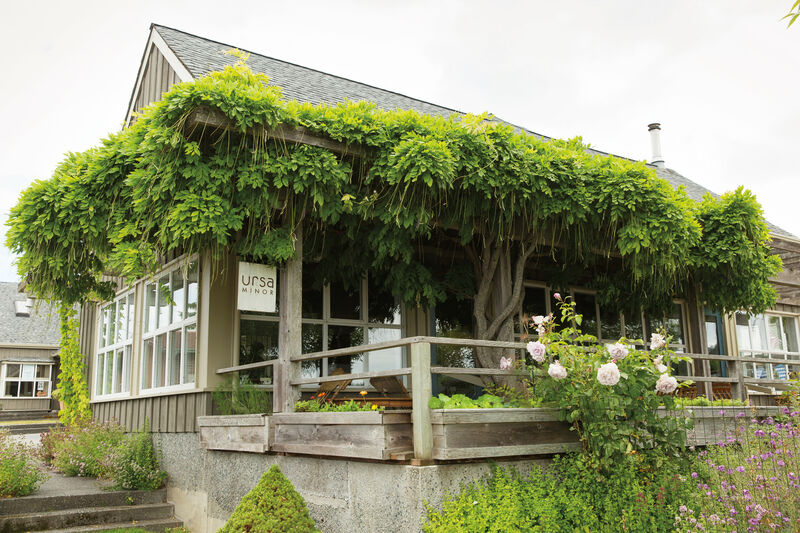 Ursa Minor’s menu takes that island dependence to more composed extremes: Nearly every ingredient comes from these islands, or perhaps the Skagit farmland on the other end of the ferry. Coffey views his menu the same way he did a camera lens when he studied photography back in college in Milwaukee—a way to take the same oyster mushrooms and cauliflower heads and pork belly that every other chef sees, and expose it from a different perspective. In his hands, meaty oyster mushrooms straight off the grill become a full-fledged dish when dusted with the deep green saline notes of dehydrated sea lettuce; a golden orb of raw egg yolk presides on the heavy ceramic plate like a sun, ready to lend richness. That photography background also means Coffey’s platings might as well be art; an unruly tumble of arugula shoots, tossed with hazelnuts in a sauce of malt and dried chilies, curves along the rim of the plate, beneath a salty sunshower of cured egg yolk. Ursa Minor’s airy dining room. 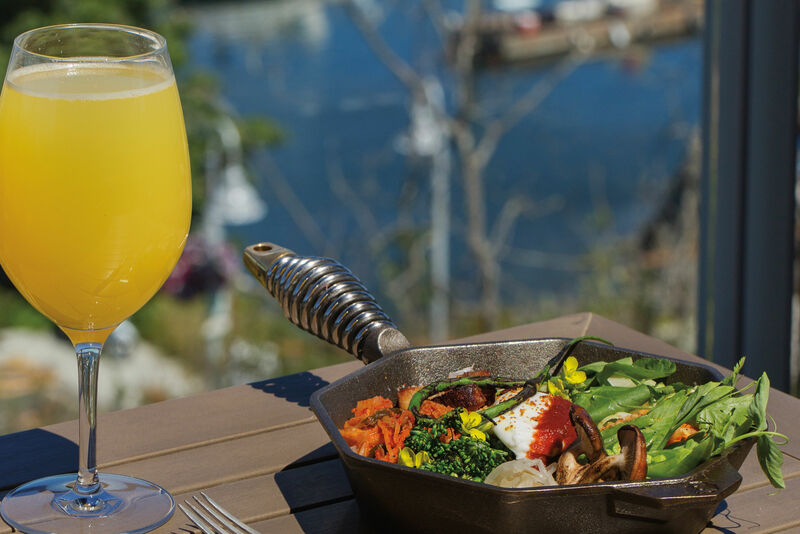 Island life comes with challenges and rhythms foreign to Seattle restaurants. Running out of ingredients is inevitable. Summer will always be bananas busy; winter will always be dead. In the course of a single night, a snake slithered through Ursa Minor’s front door, an owl took up temporary residence on the roof, and a famous astronaut and an even more famous tech legend both came in to dine. If Coffey opened a restaurant in Seattle, it’s far less likely one of the most powerful men in the world and someone who has literally been to the moon would end up in his dining room versus one of so many others (much less on the same night). Not that he escaped notice back in the city. 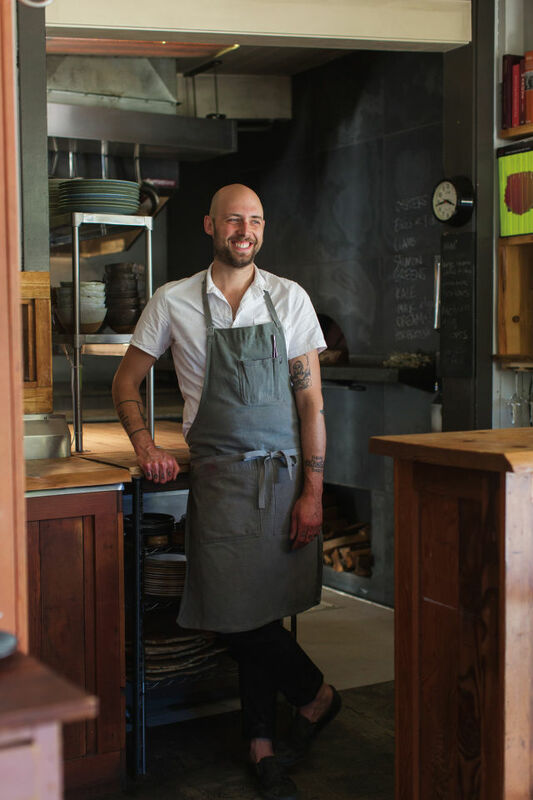 After finding his line-cook legs at Bastille, Coffey wanted to work for chef Matt Dillon, to be at the forefront of wild foods and fermentation and working closely with farmers—minimizing in every way the degrees between the kitchen and the land. He rose to chef de cuisine at Dillon’s Sitka and Spruce, then a subsequent stint at Cafe Barjot attracted attention with dishes like squid in mushroom jus and wild chamomile ice cream. When it came time to open his own restaurant, though, it only took a few scans of Seattle real estate listings to cement his alternative plan—a minimally accessible island populated by maybe 2,500 people. 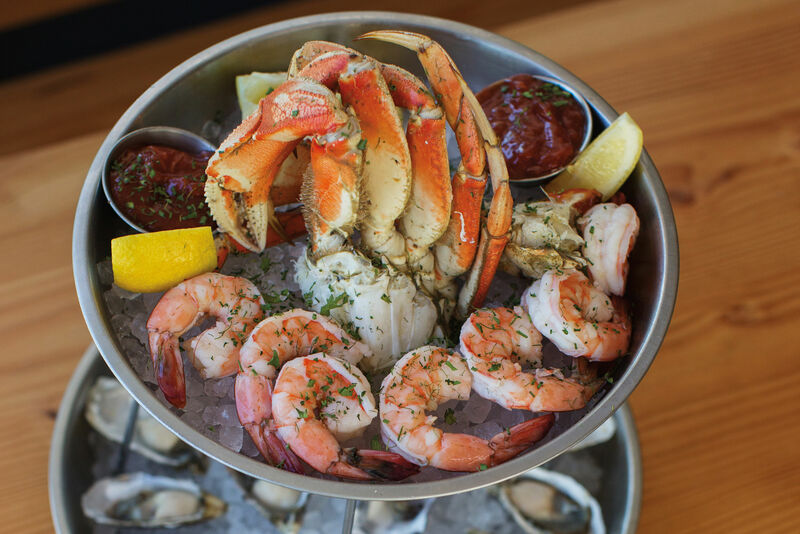 In a year of eating my way through Seattle’s new restaurants, the meals that remain the most vivid in my mind are ones that happened on the farthest, watery reaches of the contiguous United States. Sure, the scenery and the sense of being a boat ride away from real-life responsibilities could be a part of that. But there’s something else happening. Now that Seattle has built a reputation as a place where chefs work directly with farmers and can forage their own produce, the next wave is chefs like Coffey, who pick up and move themselves into the middle of all these ingredients. It’s a bold act—even when the food is pure comfort. Chef Deborah Taylor’s salmon, falafel, and mussels escabeche. Port Townsend sometimes gets described as a city in amber, a Victorian seaport 40 Puget Sound miles northwest of Seattle, buffered from the passage of time by an ample historic district. 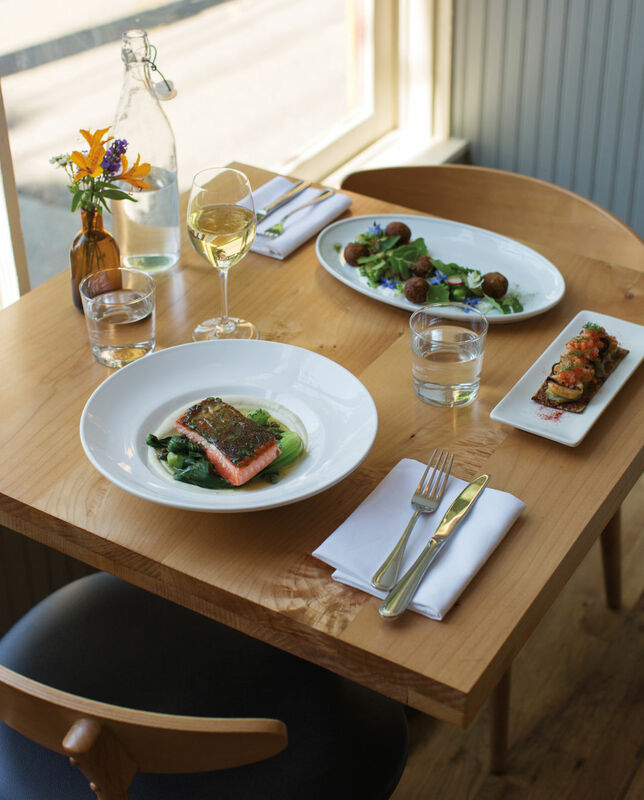 At first glance the dinner menu at Finistère on the bluff known, most accurately, as Uptown feels the same. Risotto. Deviled eggs. A salad of baby beets with goat cheese. The first round of snacks, though, is chef Deborah Taylor’s opening volley in a tightly built argument for the transformative power of fundamental technical skills. Chicken liver mousse is smooth as the crossing on the Hood Canal Bridge, and in the onion jam, Taylor wields piquancy like a precision tool. The smallest dice of shallots and cornichons deliver big, crunching impact in the steak tartare, alongside the acidic voltage of mustard aioli and lemon juice. I was whipsawed even before I punctured the perfect egg yolk perched on top and spread the whole thing on a slice of seeded sourdough bread, grilled with ample butter. We still had plenty of courses to go—risotto with spot prawns, rich black cod from nearby Neah Bay atop a fragrant chickpea and kale sofrito—and I was already mourning that this meal would eventually come to an end. 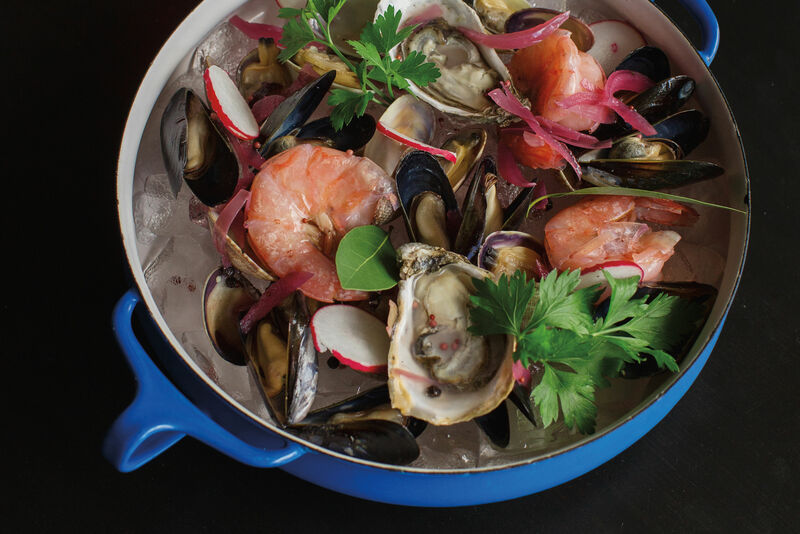 Taylor cooked in some of Manhattan’s and Seattle’s best kitchens before she opened Finistère in Port Townsend. What the couple wanted to do was strike a tricky balance: A place with equal appeal to local regulars and visitors in search of something memorable. In this, Finistère succeeds utterly. Ross puts his longtime front-of-house experience to good use in the dining room, where turn-of-the-century schoolhouse vibes meet wainscoted walls of sky blue. 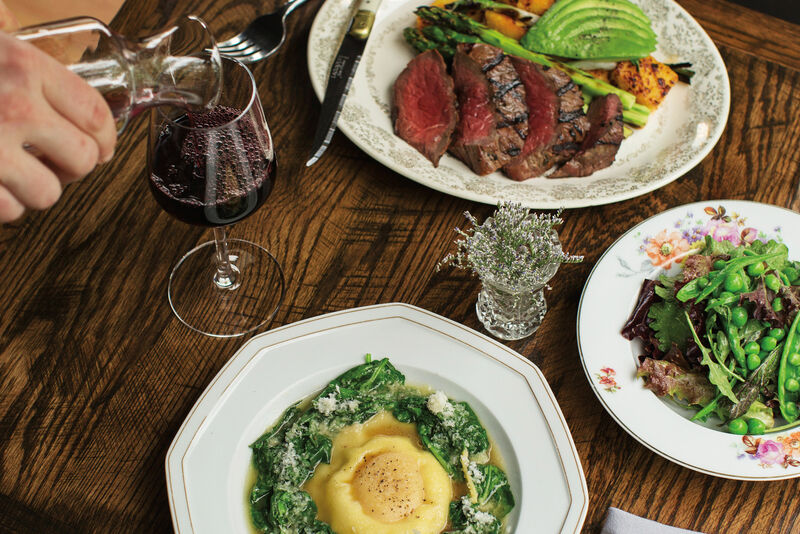 Locals come time and again for perfectly fried oysters, while a $50 tasting menu with $30 wine pairings refashions Taylor’s comforting plates as destination dining. Some of Taylor’s purveyors are the same farmers she worked with at Canlis and Staple and Fancy. 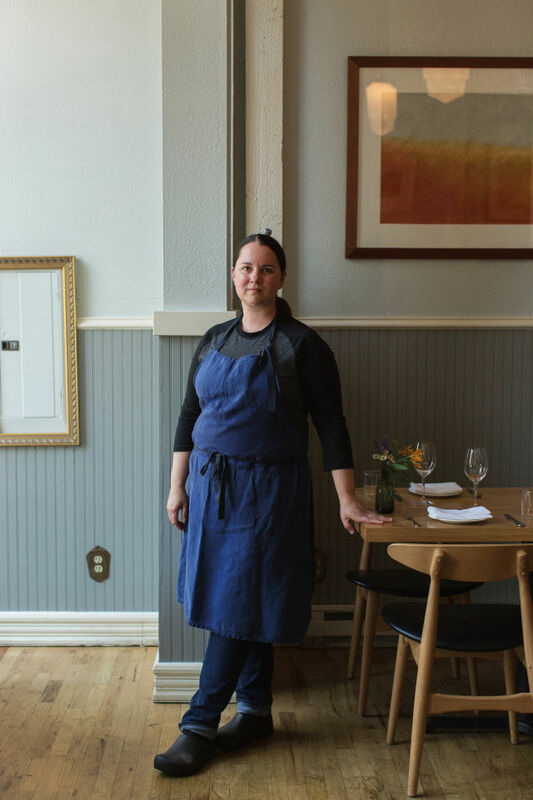 Back then, she would peruse a fresh sheet and send an email; now produce fit for Seattle’s best restaurants grows just down the road. 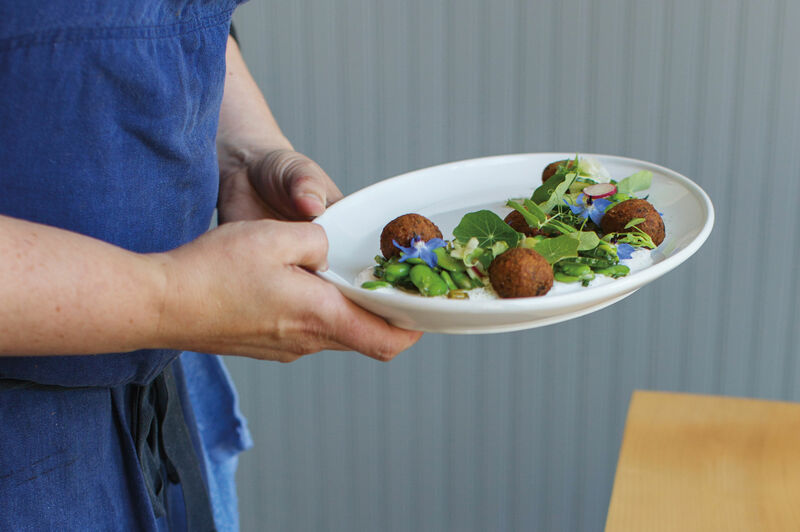 The farmers who raise her ducks and deliver the first spring peas eat at her restaurant. Not every week, but often enough to understand what Taylor’s trying to do, and talk to her about what’s coming. 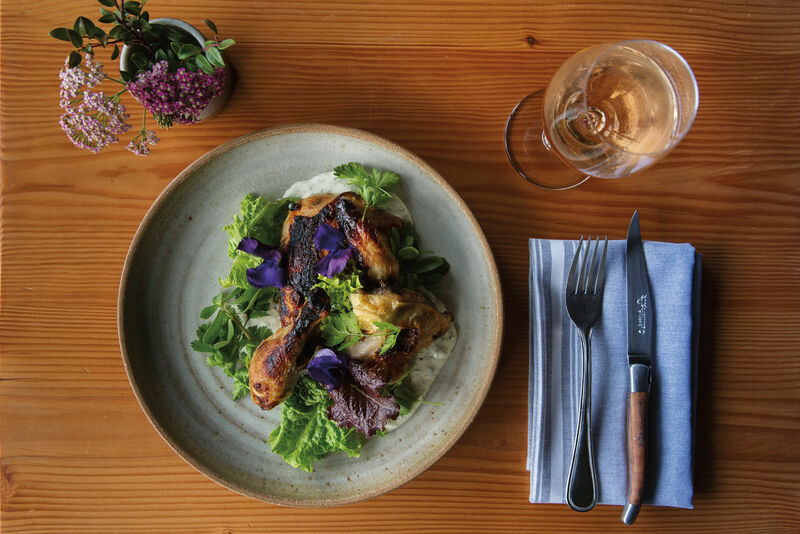 When Taylor and Ross arrived in the rich farmland of the upper Olympic Peninsula, surrounded by cideries and just up Highway 101 from some of the state’s best oyster territory, the parallels with France’s Brittany coast were obvious. There, the westernmost region is Finistère, Frenchified Latin for “end of the earth.” The name felt fitting. They took over the former home of mainstay cafe Sweet Laurette and lettered the words “End of the land at the source” on the broad front windows. While Taylor acknowledges the Olympic Peninsula is more of a fountainhead than true end of the land, Finistère is part of a shift that carries north across the water. The moment Jay Blackinton appears at my table with a cardboard pizza box and a can of Rainier is his favorite in the 10- to 14-course menu at Ælder, a deliberate crescendo built via a flurry of plates the chef freely refers to as “tweezer food”: deep golden orbs of fried sourdough pancake stuffed with pig face, each dotted with fig paste and a single leaf of anise hyssop, then a pool of fresh peas, double shucked, and littleneck clams in a broth of pea shells and fat from pigs Blackinton raises on a friend’s property here on Orcas Island. 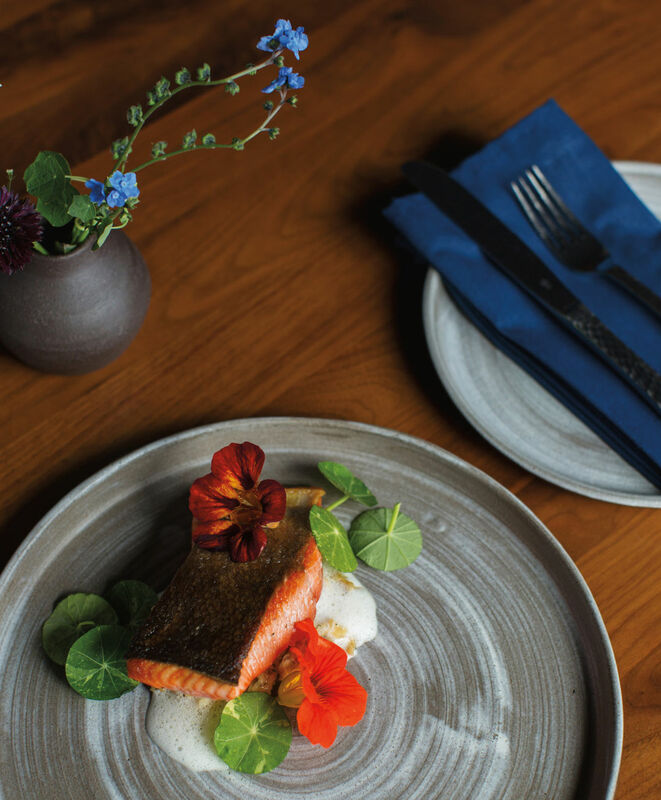 His life and business partner, Jocelyn Cecil, runs Ælder’s 27-seat dining room with a sort of limpid hospitality, but the chef delivers this course personally. He points out how the mingled aroma of hot pizza and cardboard delivery box evokes the pies of his childhood—he’s right—and fishes the Rainier can from his apron pocket to crack open and pour into our glasses. Dinner at Ælder (pronounced Al as in Gore, der as in a snarky sixth-grader) is the most impressive meal I’ve had all year. For a guy so connected to the purity of seasons, Blackinton’s creations don’t just reveal the innate beauty of his ingredients. He packs an entire dinner’s worth of tastes and textures and sensations into one ceramic bowl, like the beets, roasted for hours on the wood-oven hearth, then peeled and cooked in rhubarb juice. Blackinton conceals them, with some burnt alliums under the placid surface of some potato foam, then sprinkles it with roe. Their discovery is an unexpected pleasure, a salty-sweet-fat-smoke progression that plays out in each bite. 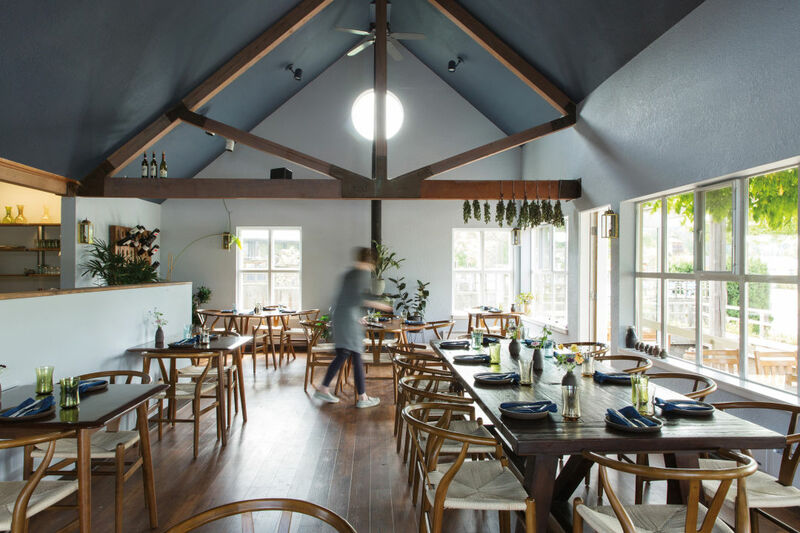 This tasting menu–only restaurant grew out of the couple’s wood-fired pizzeria, Hogstone (which explains the chewy, blistered perfection of that surprise pizza, dressed with kale, garlic scapes, and goat cheese smoked with hay). Blackinton, his features delicate but sober behind a light brown beard, grasps the fact that a good tasting menu isn’t merely a barrage of wee dishes, but a narrative with as much careful pacing as a great novel. What’s even more amazing than this parade of dishes is that the chef who conceives them didn’t cook professionally until he arrived here from Seattle. Jay Blackinton’s riffs might involve lamb tartare with horseradish and puffed wheat, or Dungeness crab with nasturtium emulsion and an oil made from crab shells and chilies. As a kid, Blackinton visited his grandparents on Orcas; as a 21-year-old he returned a disaffected bike messenger who worked too much and drank too much and thought farming might be a truer path. He signed on as a farmhand at Maple Rock Farm; Hogstone has its roots in the pizzas he fired for friends in the farm’s wood oven. Tonight, thanks to a summer rainstorm, Hogstone shares Ælder’s low-eaved dining room. But most nights, the pizzeria is a joyful outdoor affair in the yard just beyond the building’s wood oven. People sit behind a split-rail fence and devour pies topped with oyster mushrooms and green garlic at picnic tables. There are strings of lights, even a hostess stand. Ælder’s origin story is evident in the small plates, like a lamb tartare, its surface coated with horseradish emulsion and puffed heirloom wheat. Back inside at Ælder it’s time for the final course; the chef returns, for the first time since the pizza interlude, bearing a folded cloth napkin that cradles eight salmonberries. Blackinton’s voice is hushed, almost reverent as he explains these are the first of the season. The fragile ruby-colored flesh harbors a tartness that tastes somehow delicate—the same exhilarating progression as the chef’s more composed dishes, plucked directly from nature.